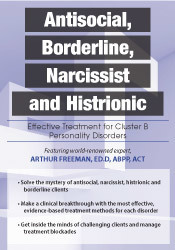 Arthur Freeman, Ed.D., ABPP, ACT, is a licensed clinical psychologist. He is a leading expert in the field of Cognitive Behavioral Therapy. He has written several books on cognitive behavior therapy and personality disorders. Dr. Freeman is in demand as an educator, speaker, consultant, and therapist. He has lectured in 40 countries at workshops, institutes, hospitals, universities, and at international meetings. His work has been translated from English into 15 other languages. In his 30+ years of practice, much of Dr. Freeman’s success as both an educator and therapist has been attributed to his vast knowledge and understanding of the therapeutic relationship and the nature of therapeutic change. His warm, yet no-nonsense demeanor and his results-driven approach, have allowed him to work with a broad range of individuals and with a broad range of psychological and life problems. Dr. Freeman is Board certified by the American Board of Professional Psychology in Clinical Psychology, Cognitive Behavioral Therapy, and Family and Couples Therapy. In addition, Art is a Distinguished Founding Fellow and Diplomate of the Academy of Cognitive Therapy, holds a Diploma in Adlerian Therapy, and was elected a Fellow of the American Psychological Association. He has served as President of the Association for Behavioral and Cognitive Therapies, President of the International Association for Cognitive Psychotherapy, and Vice-President of the National Association for Adlerian Psychology. He has won numerous awards for his contributions to the field of psychology.